First ate here since was attending a conference. There was a protest outside the Convention Center and didn't want to go outside but wanted a reasonable sit down meal. I had the Spinach and Strawberry salad with a side of steak. Yes, you read that right-you can get an eight ounce side of steak for 9 dollars. I really enjoyed the salad and the steak was good also. I ordered medium-got medium well but was still enjoyable. My husband got a quesadilla which he enjoyed. They also have brewed ice tea for 3 dollars. (I thought that was very reasonable for a Hilton connected to a convention center). We actually came back the next night and I had the same thing. This time my steak was well done instead of medium but still very tasty. My husband got the steak sandwich with a side of fruit which he stated was enjoyable. Overall I would return even when not attending a convention. The service the first night was fabulous. Still good the next night but not fabulous but it was a much busier time Also they are open late evening which can be hard to find. We returned before 11pm after a show and wanted a glass of wine before retiring.... there was only one person serving the entire bar area and many people had the same desire.... my husband finally walked over to the bar to order our wine (after waiting over 15 minutes). We also decided to share a piece of carrot cake, which was very good. We were staying at the Hilton San Jose, so this was the in-hotel restaurant for us. We ate here multiple times during our trip because it was just the easiest option. The breakfast buffet is a bit pricey, but has a good variety of hot and cold items. They have a make-your-own yogurt, oatmeal, eggs, bacon, sausage, potatoes, french toast, various breads, fruits, cereal, milk and juices as well as omelettes from the kitchens. For dinner, our group very much enjoyed the steak sandwiches which are cooked to your preference, the fries which are crispy and very nice, and my husband loved the curry dish that he ordered. Service was always prompt and friendly. Drinks were refilled and we were kept quite happy and felt appreciated as customers. Highly recommended if you're looking for a quick bite around the San Jose convention center. 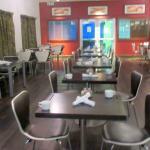 Been to Affinity Restaurant & Bar? Share your experiences!